All parents have to deal with behavior problems in children. Young children can develop many troublesome behaviors as they get older, and dealing with this behavior can be taxing. From hitting and biting to interrupting and whining, read on to find out how to handle the most common child behavior problems. Problem: Whether it's time to pick up toys or leave the park, you are instantaneously met with a very dramatic and whiny, "I don't want to." Children who whine habitually start to do so even for things as simple as asking for a glass of milk. As annoying as whining can be, nearly all children do it at some time or another. Solution: The best way to handle whining is to ignore it as much as possible. If your child wants something and whines to get it, simply say, "I can't understand you when you whine. Use big kid words, please." If your child whines again, ignore him. Giving in to whining just one time can teach your child that whining is an effective means of getting what he wants, and then of course, he'll whine even more often. Consistency is extremely important if you want to eliminate or reduce whining in your home. Problem: Food battles are among the most common behavior problems in children. While it's normal to go through phases, a lot of children balk at the thought of broccoli or an extra serving of fruit. Solution: The best way to handle this problem is to avoid the conflict in the first place. Experts, such as Heidi Murkoff, author of "What To Expect The First Year," state that eating habits begin forming during infancy, and it is important for parents to offer healthy foods consistently and repeatedly. She also cautions against turning eating into a control issue. You can force a child to sit at the dinner table for three hours until he eats that last pea, but the bottom line is, if he doesn't eat it, you cannot force it into his mouth. If your child is strong willed enough, you will lose this battle if you allow it to become a control issue. Problem: Young kids often develop selective hearing. They hear their mothers call them for dinner, but somehow their ears fail them when it's time for a bath or to clean up toys. Solution: Child expert and educational consultant Dr. Michelle Borba states that rather than calling to children from another room, children will listen better if parents go to their children, make eye contact with them, and tell them what they want them to do. Kids are much more likely to follow instructions when parents tell them what is expected of them and what the results will be if they comply and what will happen if they don't. If you want your children to pick up their toys, go to them and say, "You need to take these trucks into your room. If you don't clean them up, I'm going to pick them up and keep them in my room for a few days." The children have the choice to comply or not, but they know what the consequences will be if they don't. Problem: Young children sometimes lack the language skills to express feelings of frustration or anger. When another child takes away a toy, some children can't say, "Hey, that's mine! Give it back!" So instead, the offended child might resort to physical reactions such as biting or kicking. Solution: Kids who hit and bite need to be taught gently that these behaviors are unacceptable. Parents can take their child's hands and say, "Gentle hands. We use nice touches with our hands," or "Mouths are for eating, not biting." 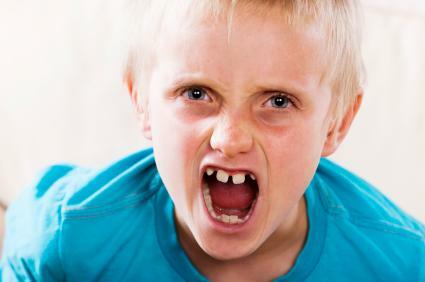 Parents may use time-outs to discourage aggressive behavior, but they should never hit or bite their children as punishment for this behavior. Problem: Most moms have a story about carrying their screaming and crying child through a store. Tantrums are usually the result of a child not getting something that he wants, as well as not having the cognitive ability to regulate his emotional response or verbally express how he is feeling. The screaming and crying that results are due to frustration and anger. Planned ignorance: This means not paying any attention to the child (unless of course he is injuring himself or someone else). Let the child throw a fit without you acknowledging him; when he realizes he will not get a response, he will likely stop. Use distraction: Try to get your child interested in some other activity, make him laugh or pick him up and hold him. Distracting your child can make him forget about why he was screaming. Use timeouts: Place your child in a safe area or have him sit in a chair until the tantrum subsides. Do not start timing your child (one minute for every year of age) until he is calm and quiet. Use the quiet time to talk to your child about what went wrong, and how to change it for next time. Problem: Many parents find interrupting to be one of the most annoying behavior problems in children. Kids have a lot to say and they want to say it now, even when their parents are on the telephone or trying to talk to one another. Solution: Experts, such as Dr. William Sears, say that young children need to be encouraged to wait, rather than interrupt, but they can only wait for short periods of time. Developing a hand signal, such as holding up one finger, can let your child know that you want to hear what he has to say, but you are busy at that moment listening to someone else. It is human nature for children to be impatient, to whine and cry and to generally misbehave. Many of these behaviors provide a learning experience for both children and parents. Children test limits as a way to learn about rules and how to act appropriately, and parents need to provide guidance and discipline to teach children how to respond appropriately. While these types of behaviors can be annoying or bothersome, most are not out-of-control or harmful to you, your child or other people. If you respond consistently and calmly, most behavior issues can be resolved in a short period of time.